Long-lasting battery provides full 8-hr shift performance. The LXE 8650 Bluetooth ring scanner is a comfortable and easy to implement productivity tool for all mobile operators who regularly need to scan barcodes. The small, lightweight 8650 ring scanner rests on the finger, with the Bluetooth module worn comfortably on the wrist. The Bluetooth module may be paired with any Bluetooth-enabled handheld, wearable, fixed-station or vehicle-mount computer, and reliably transmits critical data from up to 30-feet away. Operators gain unsurpassed freedom of movement to perform barcode reading tasks quickly, safely and comfortably - all while keeping both hands free to perform tasks. Lithium ion battery for 8650 ring scanner (Bluetooth module). Includes 6-month warranty from date of shipment. AC Power Cable, C8 type, British 3-Blade. Non-Cancelable/Non-Returnable. AC Power Cable, C8 type, Europlug. Non-Cancelable/Non-Returnable. 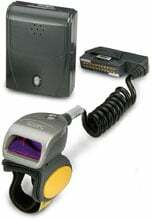 The LXE 8651A100BTLASERKIT is also known as LXE-8651A100BTLASERK	.